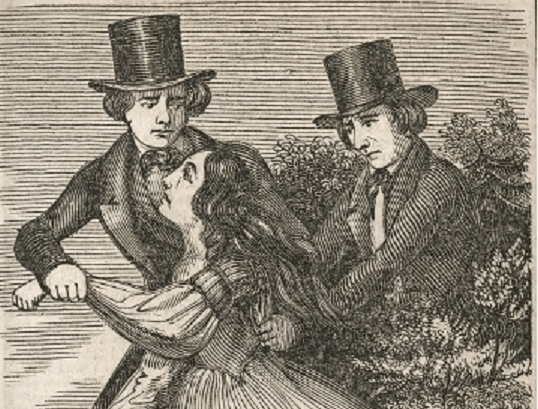 In the 1840s, writers (and illustrators) presented many accounts of crimes against women. These lurid tales have a lot in common with today’s television shows that feature stories “ripped from the headlines.” One of the earliest in the genre is Edgar Allan Poe’s “The Mystery of Marie Rogêt.” In it, Poe presents the forensic evidence surrounding the murder of Mary Rogers, whose body was discovered floating in the Hudson River on July 28, 1841. When the first installment appeared in late 1842, Poe caught the public’s imagination by promising to solve the Mary Rogers case with the evidence that had been made public—at a time when the infamous crime had not been solved. Curator of The Davida T. Deutsch Program in Women’s History Cornelia King will show a range of material related to the case and other similar cases as they appeared as stories in 19th-century sensational fiction.